Last weekend, I had flashbacks to signing for college loans; it’s amazing how clueless I was! As the 6th of 7 kids, there were no savings and after my first year, my parents could no longer help me and I was on my own. I remember signing off on loan applications without really reading anything and certainly not understanding the magnitude of the repayment demands awaiting me once when I finished college. Over the summer I shared about this common myth about college savings: “If you save too much, you won’t quality for any financial aid.” I hear parents state this myth as truth repeatedly. Read the truth here; I think this initial bit of knowledge is the first step to getting started. I am almost embarrassed to admit that I had a total DUH! moment when I read this fact about saving versus borrowing: “Why is saving [versus borrowing] a better option? 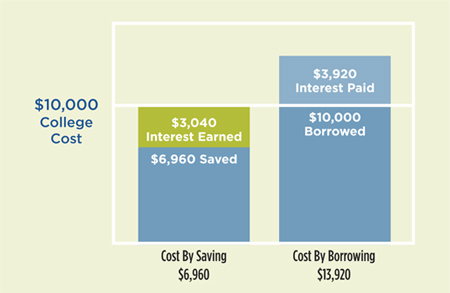 Because you pay interest on the money you borrow, but you earn interest on the money you save.” This graphic offers a helpful big picture example of the concept. I would totally rather pay $6,960 than $13,920 on $10,000, wouldn’t you? In this post from last fall I shared resources for basics related to getting savvy about the college savings process. There’s really good primer material here that’s totally not scary! I’m a visual person and this graph I shared last year including hypothetical examples for what monthly investments of $50, $100, and $300 can result in was so helpful for me. I recommend sitting down and looking at your budget with this graphic in mind; it may help you think about where you can trim in order to up your monthly investment. I truly hope this material is helpful! When you’re ready to take the plunge, head over to the MEFA U.Fund page to learn more! Disclosure: I’ve partnered with Fidelity & MEFA for this post in support of the U. Fund Dreams Tour. All thoughts and opinions are -- of course -- my own.